Offering Propane Tanks - Factory Direct We do not offer parts, repairs or other services. 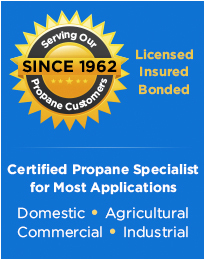 Propane Tanks are used in various applications such as RV, Forklift, Floor Buffers and Boat. We have Propane Tanks for Sale in many sizes from 5 lb – 100 lb. We offer Propane tanks in vertical and horizontal sizes. Available in corrosion resistant steel and some in light weight aluminum. You will find tanks for most all applications including RV, forklifts, bbq's, marine, recreational, industrial, floor buffers, torches, burners,and many other uses. Many free propane facts related to gas grill safety, gas range safety, industrial safety, re-certification, re-qualification, water heater energy savings tips, specifications, measurements and many other free helpful guidelines are provided in the links to the right. Propane is a clean burning natural resource used by millions of people on a daily basis and when used properly, propane is one of the safest sources of energy available today. See our Energy Saving Tips page for other helpful info.